Powers up Water-type moves in a pinch. The Pokémon gradually regains HP in rain. X When tapped, this Pokémon will pull in its head, but its tail will still stick out a little bit. X Bei Gefahr zieht dieses Pokémon seinen Kopf ein. Die Schwanzspitze ragt jedoch aus dem Panzer heraus. X Attaqué, il cache sa tête dans sa carapace, mais son corps trop gros ne peut y tenir en entier. X Si es golpeado, esconderá su cabeza. Aun así, su cola puede seguir golpeando. X Quando si sente minacciato ritira la testa nella corazza, mentre la coda sporge sempre un po’. X 딱 하고 머리를 맞을 때 등껍질로 숨어서 피한다. 하지만 꼬리가 살짝 삐져나와 있다. Y It is said to live 10,000 years. Its furry tail is popular as a symbol of longevity. Y Man sagt, es werde 10 000 Jahre alt. Sein buschiger Schweif ist ein Symbol für langes Leben. Y On prétend qu’il vit 10 000 ans. Sa queue duveteuse est un symbole de longévité populaire. Y Se dice que vive 10 000 años. Su peluda cola es un símbolo de longevidad. Y Pare che viva 10.000 anni. Ha la coda ricoperta da una folta pelliccia, indice di longevità. Y 만 년의 수명을 가지고 있다고들 말한다. 치렁치렁한 꼬리는 장수의 상징으로서 인기가 있다. Omega Ruby Its tail is large and covered with a rich, thick fur. 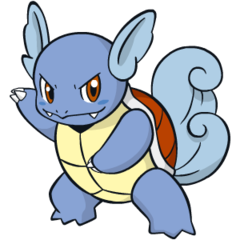 The tail becomes increasingly deeper in color as Wartortle ages. The scratches on its shell are evidence of this Pokémon’s toughness as a battler. Omega Ruby Schillok hat einen langen, buschigen Schweif, dessen Farbe intensiver wird, wenn es altert. Die Kratzer auf seinem Panzer zeugen von seiner Kampfkraft. Omega Ruby Carabaffe a une large queue recouverte d’une épaisse fourrure. Elle devient de plus en plus foncée avec l’âge. Les éraflures sur la carapace de ce Pokémon témoignent de son expérience au combat. Omega Ruby Tiene una cola larga y cubierta de un pelo abundante y grueso que se torna más oscuro a medida que crece. Los arañazos que tiene en el caparazón dan fe de lo buen guerrero que es. Omega Ruby La grande coda di Wartortle è coperta da una folta pelliccia, che diventa sempre più scura con l’avanzare dell’età. I graffi sulla corazza indicano la potenza di questo Pokémon come lottatore. Omega Ruby 푹신한 털로 덮인 큰 꼬리는 오래 살수록 깊은 색으로 변한다. 등껍질의 상처는 강자임을 증명한다. Alpha Sapphire Its tail is large and covered with a rich, thick fur. The tail becomes increasingly deeper in color as Wartortle ages. The scratches on its shell are evidence of this Pokémon’s toughness as a battler. Alpha Sapphire Schillok hat einen langen, buschigen Schweif, dessen Farbe intensiver wird, wenn es altert. Die Kratzer auf seinem Panzer zeugen von seiner Kampfkraft. Alpha Sapphire Carabaffe a une large queue recouverte d’une épaisse fourrure. Elle devient de plus en plus foncée avec l’âge. Les éraflures sur la carapace de ce Pokémon témoignent de son expérience au combat. Alpha Sapphire Tiene una cola larga y cubierta de un pelo abundante y grueso que se torna más oscuro a medida que crece. Los arañazos que tiene en el caparazón dan fe de lo buen guerrero que es. Alpha Sapphire La grande coda di Wartortle è coperta da una folta pelliccia, che diventa sempre più scura con l’avanzare dell’età. I graffi sulla corazza indicano la potenza di questo Pokémon come lottatore. Alpha Sapphire 푹신한 털로 덮인 큰 꼬리는 오래 살수록 깊은 색으로 변한다. 등껍질의 상처는 강자임을 증명한다. Red Often hides in water to stalk unwary prey. For swimming fast, it moves its ears to maintain balance. Blue Often hides in water to stalk unwary prey. For swimming fast, it moves its ears to maintain balance. Yellow When tapped, this Pokemon will pull in its head, but its tail will still stick out a little bit. Stadium The tail is covered with a rich fur. It stores air in the fur before taking extended dives underwater. Gold It is recognized as a symbol of longevity. If its shell has algae on it, that Wartortle is very old. Silver It cleverly controls its furry ears and tail to maintain its balance while swimming. Crystal Its long, furry tail is a symbol of longetivity, making it quite popular among older people. Stadium2 It is recognized as a symbol of longevity. If its shell has algae on it, that Wartortle is very old. Ruby Its tail is large and covered with a rich, thick fur. 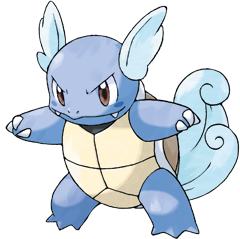 The tail becomes increasingly deeper in color as Wartortle ages. The scratches on its shell are evidence of this pokemon's toughness as a battler. Sapphire Its tail is large and covered with a rich, thick fur. The tail becomes increasingly deeper in color as WARTORTLE ages. The scratches on its shell are evidence of this POKeMON's toughness as a battler. FireRed This POKeMON is very popular as a pet. Its fur-covered tail is a symbol of its longevity. LeafGreen It often hides in water to stalk unwary prey. For fast swimming, it moves its ears to maintain balance. Emerald Its large tail is covered with rich, thick fur that deepens in color with age. The scratches on its shell are evidence of this POKeMON's toughness in battle. Diamond It is said to live 10,000 years. Its furry tail is popular as a symbol of longevity. Pearl It is said to live 10,000 years. Its furry tail is popular as a symbol of longevity. Platinum It is said to live 10,000 years. Its furry tail is popular as a symbol of longevity. HeartGold It is a well-established symbol of longevity. If its shell has algae on it, that WARTORTLE is very old. SoulSilver It cleverly controls its furry ears and tail to maintain its balance while swimming. Black It is said to live 10,000 years. Its furry tail is popular as a symbol of longevity. White It is said to live 10,000 years. Its furry tail is popular as a symbol of longevity. Black 2 It is said to live 10,000 years. Its furry tail is popular as a symbol of longevity. White 2 It is said to live 10,000 years. Its furry tail is popular as a symbol of longevity.